On April 10, I spent hours binge-watching Marvel's "Daredevil," which was released exclusively on Netflix that same day. The series raised the bar not just for Marvel, but also for television in general. It's gritty, dark, and entertaining. After binging on all 13 episodes over two days, my eyes felt like mashed potatoes. I looked around my apartment and thought, "Oh wow...I haven't breathed fresh air in a while." I stepped onto the balcony and enjoyed a cup of coffee. A little later, I turned Netflix back on and noticed a show starring one of my favorite actors, Lee Pace. I read the premise and was intrigued. Then I saw that it also starred Scoot McNairy, another actor that always knows how to get it right with all of his roles. The show? 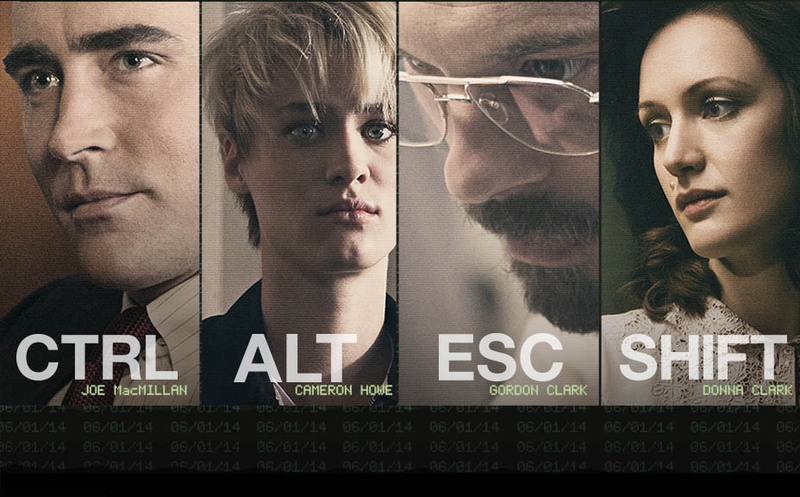 AMC's "Halt and Catch Fire". I added it to my queue with the intention of starting it on Monday night. I was curious but needed a break from watching so much television. As I dilly-dallied around my apartment, I couldn't stop thinking about the show. Curiosity got the best of me and I eventually played the first episode. A few seconds in, I was hooked. Of the ten episodes in season one, I ended up watching seven from late Saturday night and early Sunday. Despite mushy eyeballs and melted brain cells, I just couldn't resist. 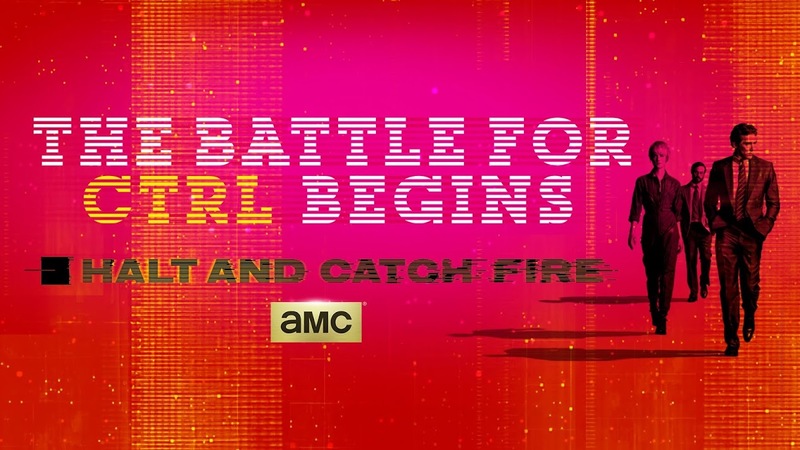 Created by Christopher Cantwell and Christopher C. Rogers, "Halt and Catch Fire" is set in the early 1980s and follows Joe Macmillan (played by the ever-handsome Lee Pace) as he infiltrates Cardiff Electric, a small computer company in Dallas, TX. He tricks his way into high position and begins to build a small team with the idea of creating the fastest computer on the market. He also has high hopes for the future of computing, and little by little begins to push his team into more elaborate concepts for his new computer. He's not concerned with how it gets done nor if it's actually physically possible, but he's going to achieve his goal. 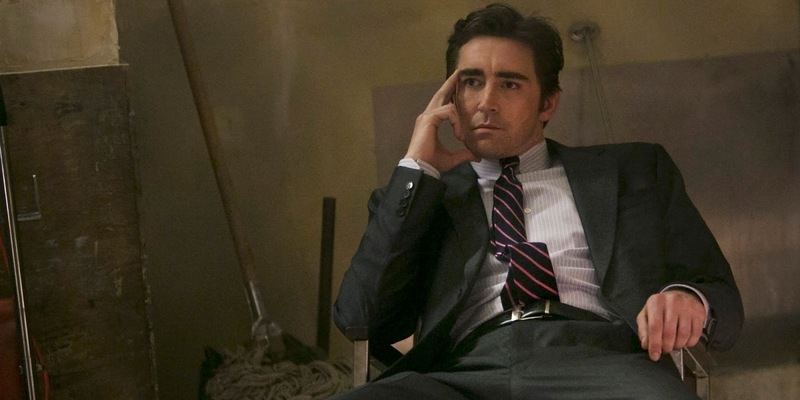 Lee Pace as "Joe MacMillan"
The '80s is known as the era of greed and excess, and this show uses that as an underlying theme. 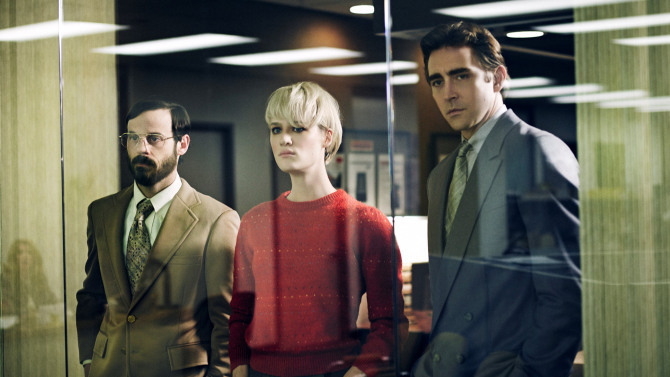 But greed isn't exploited as much as other shows and films set during this time; "Halt and Catch Fire" focuses more on manipulation and people over-promising impossible things. From the very beginning, Joe is in a constant battle with head honcho John Bosworth (Toby Huss). Is Joe trying to upgrade Bosworth's company into something more modern, or is he just a control freak? Either way, Bosworth knows full well that he's being pushed into a direction he never planned, but can't quite get back his company from Joe. Toby Huss as "John Bosworth"
Joe MacMillan is a salesman at heart and knows how to make people follow him. He quickly cons a college student software developer named Cameron Howe (Mackenzie Davis) and a once passionate engineer, Gordan Clark (Scoot McNairy), into joining him, somewhat blindly, on his ambitious project. It's this main trio of actors that first hooked me. The writers/creators have taken three different stages of a career and personified them in these three characters. Cameron is the young prodigy ready to change the world of computing. Gordon is a brilliant engineer whose best years and opportunities may have already slipped past him. And Joe is the salesman stuck underneath the shadow of his father, trying to break away from the middle and make a name for himself. In other words, all three have something to prove, even if it's just to themselves. The show is labeled as drama but fortunately the cast is wise enough to know when to add a bit of humor. Additionally, each of the three main characters have ego issues, but they show enough humility in their failures that you can't help but care for them. At times it feels like three elementary misfits getting into predicaments, then trying to find ways to get out of trouble. But overall these three are trying to innovate while hurdling everything, including their pasts. Though the series focuses mostly on Joe, Gordon, and Cameron, there's enough room in the storyline for strong supporting characters. 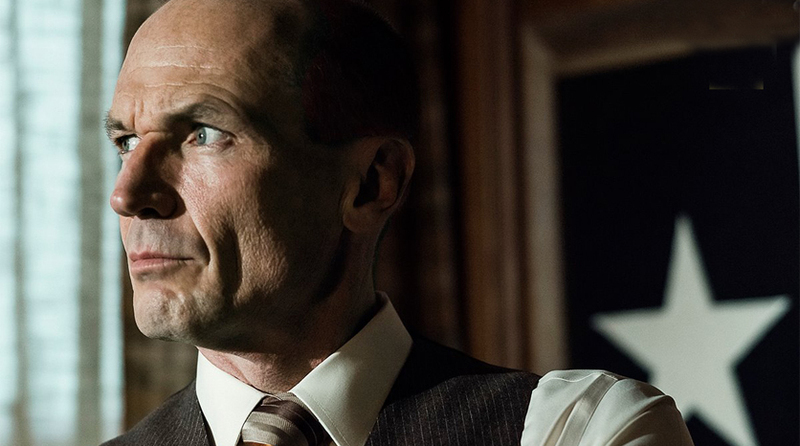 Two of the more prominent being Kerry Bishé as "Donna Clark," Gordon's intelligent wife, and the always-great Toby Huss as "John Bosworth", the president of Cardiff Electric. Both are integral to the story and to Joe's project. Bosworth, though fully aware of being fooled by Joe, knows that his best move is to support the team. And even though there's some animosity towards Joe and the gang, he does indeed support his team. Donna, a superb engineer in her own right, realizes that her husband was duped into the project and is there to support Gordon at home and, at times, in his office. As Gordon stated in one of the episodes, he knew she was smarter than him the moment they met. This is what makes these female leads (Cameron and Donna) unique to most television programs. Both are strong and brilliant without being the power-hungry stereotypes that befall most women characters. I have no doubt that this is in large part due to the excellent writing staff and the actors' decisions to make round, interesting characters. 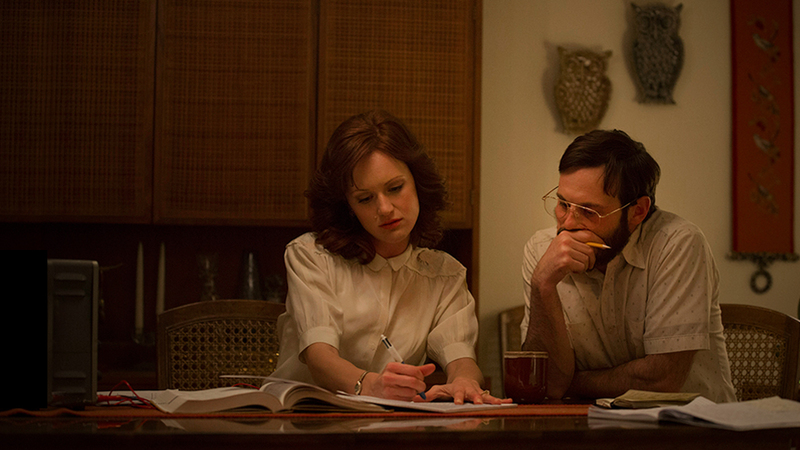 Kerry Bishé as "Donna Clark"
Compelling enough for someone with mashed potato eyes and tired brain cells to continue binging, "Halt and Catch Fire" is a unique interpretation of the computing world of the 1980s. I'm happy to learn that there's already a season two, and if all goes well, more will follow. TRIVIA: According to Wikipedia, the term halt and catch fire refers to several computer machine code instructions that cause a computer's CPU to cease meaningful operation.